Washington continues adding jobs and working-age people, which kept the unemployment rate steady at 5.8 percent in February. Washington’s unemployment rate didn’t budge from January to February even though the state added 10,600 new jobs. That’s because along with new jobs, the state saw an influx of new workers. The statewide unemployment rate for February was 5.8 percent — the same as in January. A year ago, the state’s unemployment rate was 5.7 percent. In the Seattle-Bellevue-Everett region, the rate inched down slightly to 5 percent in February from 5.1 percent in January. In February 2015, it was 4.4 percent. Nationwide, the February unemployment rate was 4.9 percent, identical to January, and down from 5.5 percent in the same month last year. Half the job growth in February was in construction, with 5,500 new jobs. Other growing sectors include leisure and hospitality, professional and business services and retail. Those gains helped to offset losses in other industries, such as manufacturing, which lost 2,500 jobs in February. “Job growth is off the charts,” Turek said. During the last few years, a high number of new jobs in any given month was about 7,000. January saw growth of 14,000 and February was more than 10,000, which are both robust, Turek said. Population growth has also been significant. During the past year, Washington added 81,800 people for a total workforce of 3.6 million in February. 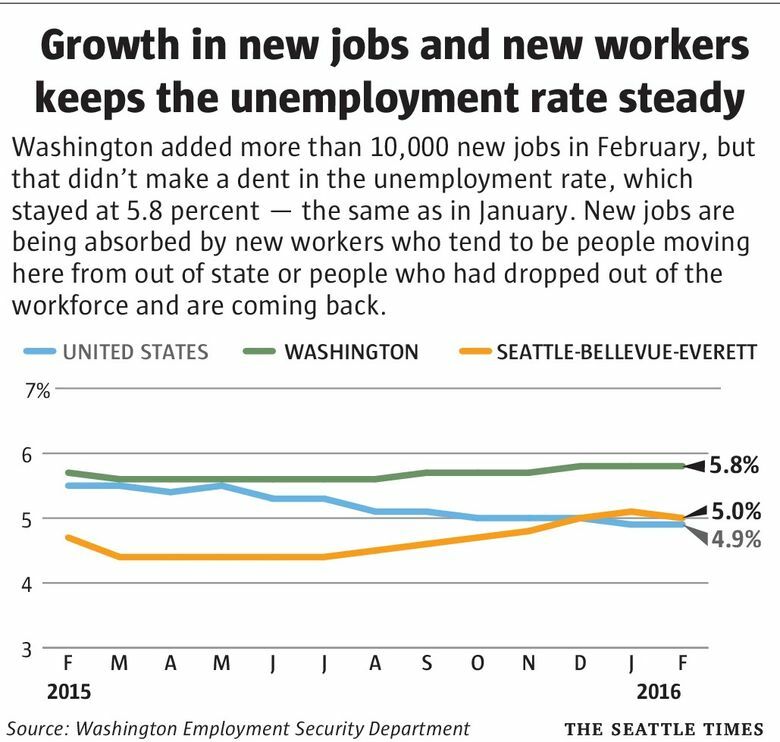 The Seattle region alone grew by 29,800 workers from February 2015 to February 2016. Those increases in population have been absorbing new job growth, which keeps the unemployment rate steady. Turek said that the growth in workers is a combination of people moving into the state and people who had been out of the job market coming back. The latter could be people who took time off from working to do something else such as earn a degree or care for family members. “The (Seattle) metropolitan area is doing well and that brings in job seekers who are moving here for jobs and continues to draw people out who hadn’t been looking for work,” said Marieka Klawitter, a labor economist at the University of Washington.